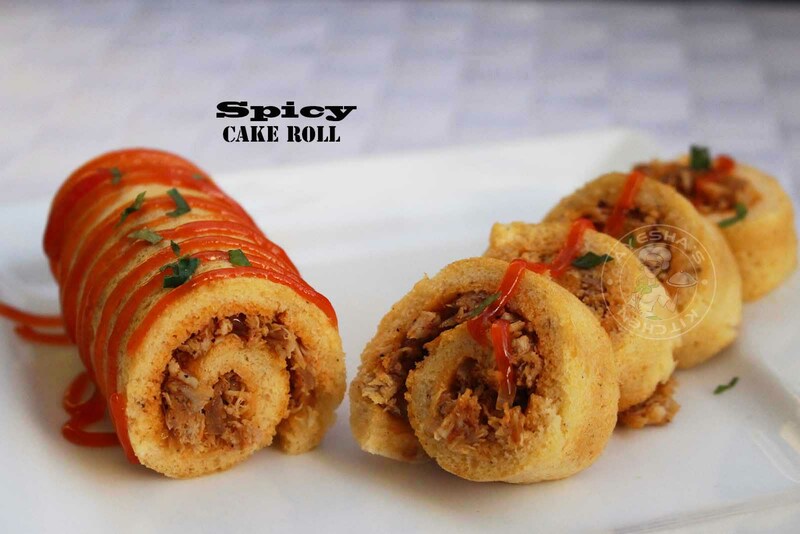 Today am here with a stovetop spicy chicken cake roll recipe that too made in a frying pan. Cake rolls or roll cakes are my family favorite sweet treat. I make simple cake rolls or roll cake often at home for my daughter instead of buying store bought cake rolls. 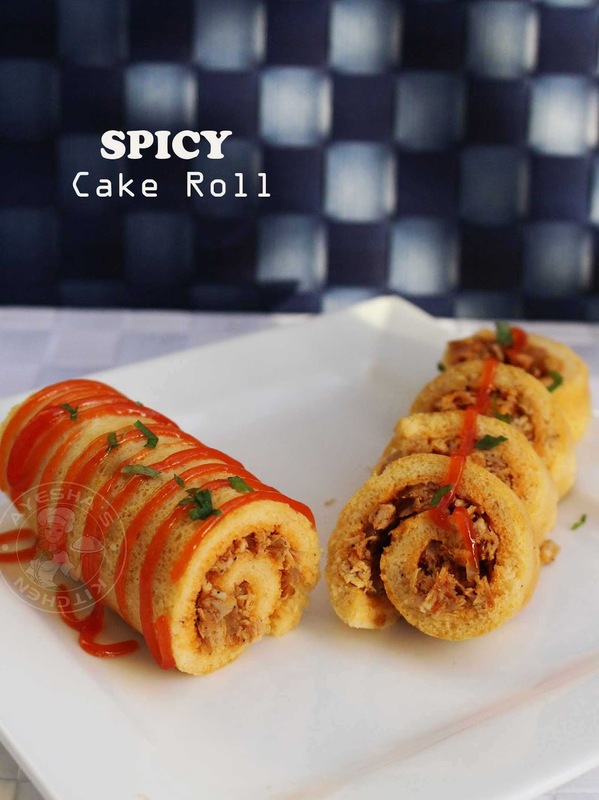 As she loves such roll cakes for school tiffin or snack box, I used to make varieties with this roll cake. This time I made a great twist to cake roll itself. A lovely transformation of sweet snack to spicy treat. You don't need a Swiss roll tin or pan or an oven for making such cute cake rolls for your family. I have share Nutella spread cake roll on my blog a few months back and am very happy that you are loved that recipe very much. I got lots of lovely comments for that recipe. 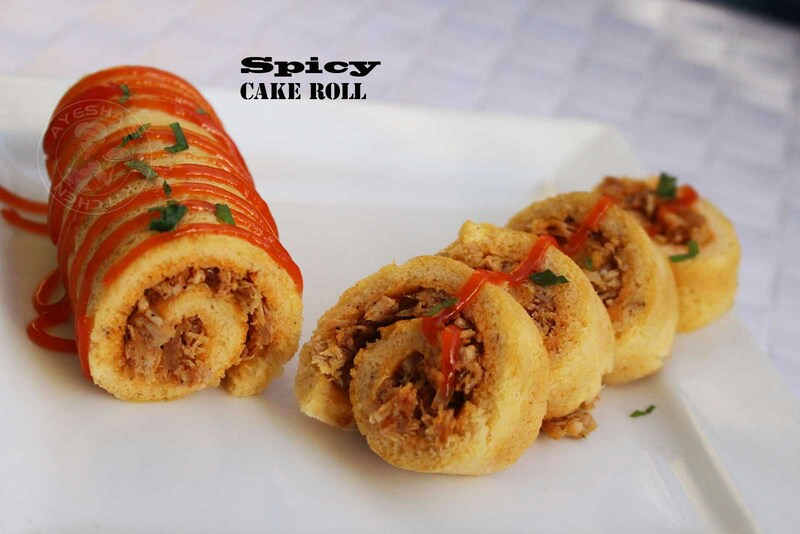 So this time, am being with a spicy cake roll recipe stuffed with spicy creamy chicken filling. Yes, as we are in search of quick and easy creative ramadan snacks, this spicy chicken snack for sure will become your favorite snack for iftar. So lets see how to make a spicy chicken roll / roll cake / cake roll/ no oven recipes/ stove top recipes / swiss roll recipe /kids snacks /easy snack recipes/ easy snacks/ snack ideas/ quick snacks/ simple snacks /snacks to make at home/chicken snacks/ snacks for kids/ easy snacks for kids /kids snack ideas / chicken roll ups /roll up . Prepare the spicy chicken filling. You can stuff with your favorite filling, but it must be spicy and aromatic. In a pan, heat oil and saute onion until lightly golden. Make a paste of ginger, garlic and green chilies. Add this paste to the sauteed onion along with some salt. Mix well. Then add chili powder, garam masala powder, and chopped coriander leaves. Saute well. Then add the minced chicken (cook the boneless chicken pieces with turmeric powder, chili powder, salt and then pulse it in a grinder for a second or two). Combine well and cook for few minutes sauteing continuously. Set aside. Make the cake roll in a frying pan. Add eggs in a bowl along with pepper powder, cumin powder, salt and beat well using an electric mixer until it turns white and fluffy (check the pics given above). You must beat it well. To this, add the sifted cake flour (recipe is given below ). Fold it gently until it is well combined. (do not beat the cake flour or do not add more cake flour than required ). Then add oil and cardamom powder (to get rid of egg flavor). Mix well with a spoon. Heat a non-stick frying pan of large size. Then make the flame to medium low. Grease the pan well with oil. Pour the prepared batter and just swirl immediately. Cover with an aluminum foil and then cook over a low flame for 5 to 6 minutes or until the top of the cake roll becomes dry. Do not cook for long. Remove from flame gently and transfer it a cling film. wrap it and gently roll it tightly. Keep refrigerated for 15 minutes. When done, take it out and remove the cling film. Open the cake roll. Cut off the ends diagonally. Add a tsp of pizza sauce or chili sauce or garlic mayonnaise to the chicken filling. This is to make a creamy filling. Dry fillings will come out easily once the cake roll is sliced. So use a creamy filling of your choice instead of dry fillings. Spread this creamy filling over the cake roll. Then roll up the cake very tightly (important) with care. Wrap in a cling film and keep them fridge to set (for 30 minutes). This gives a perfect slice. OR for those who prefer warm chicken cake rolls, let the chicken set aside for few hours at room temperature before slicing. Once done, cut both the ends and then slice it. You can substitute the store bought cake flour with this simple two ingredients. Take one leveled cup (210 ml) of All purpose flour. From this, remove two tablespoons of all purpose flour. And then add two tablespoons of cornflour/cornstarch back in instead of the removed All purpose flour. So we get one cup of CAKE FLOUR. one cup of cake flour = one cup of All purpose flour - two tablespoons of All purpose flour + 2 tablespoons of cornflour. Then sift them together to distribute the cornflour well before using in into the cake batter. Cornstarch/cornflour will inhibit the formation of gluten when added to all-purpose flour. This gives the structure and sponginess to your cake.